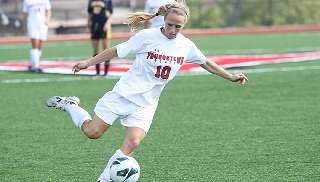 Buffalo, N.Y. -- The Youngstown State women's soccer team dropped its third straight match falling to Buffalo, 1-0, on Sunday afternoon at UB Stadium. It's also the third consecutive 1-0 loss for the Penguins, who fall to 1-3. The Bulls improve to 2-1. The Penguins and Bulls battled through a scoreless game for more than 71 minutes before Buffalo's Megan Abman pushed a shot past YSU goalkeeper Jackie Podolsky with 18:40 left. Podolsky finished the match with six saves. The Penguins had their chances posting 11 shots, including four shots on goal, but could not convert their attempts. Junior Chelsey Haney and sophomore Katie Hohmann each had four shots for the Penguins, while freshman Taylor Ross had two and freshman Kathy Baquero took one. The Penguins return to action when they host Akron, Friday, Sept. 6, at Farmers National Bank Field. Kickoff is set for 7 p.m.